While pondering this month’s Shine Supper Club challenge (eggs!) 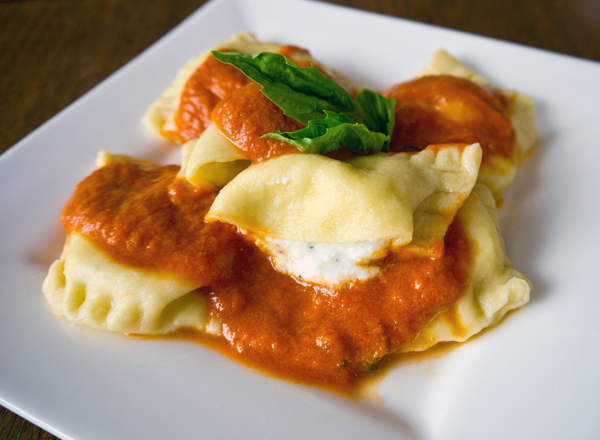 my mind kept wandering to soft and delicate ravioli. I love making homemade pasta, and do it often, and those eggs are the shining ingredient. You just can’t make tasty pasta without eggs. Really. You can’t. And no need for a pasta maker to roll out this easy recipe. This dough comes together quickly, with a rolling pin doing the majority of the work. I like to measure and add the flour directly to my counter top and then make an indentation in the center. After sprinkling in the salt and sugar, crack the eggs right into the center. But if you’re not into making a big mess, you can totally make your dough in a bowl. 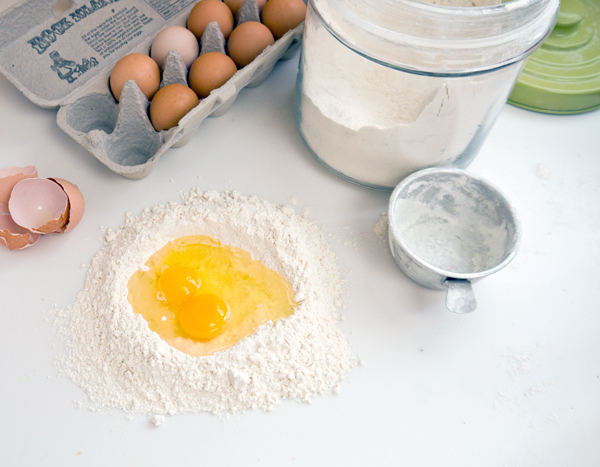 Use your fingers to slowly mix the eggs and flour together until it forms a ball. Spend a couple of minutes kneading the dough, adding flour if things get sticky. Wrap the dough in plastic wrap and place in the fridge for 20 minutes to rest. While your waiting for the dough to chill, mix together the cheese filling. 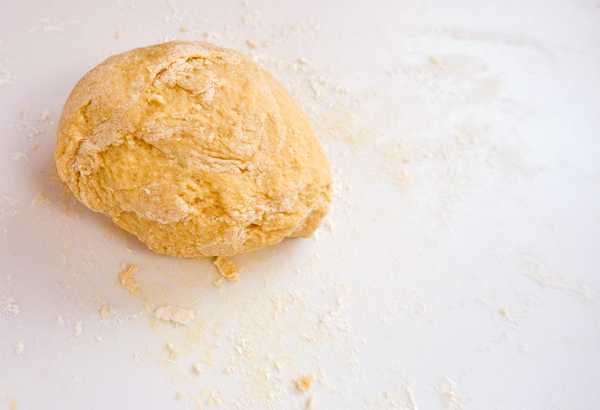 Sprinkle your work surface with flour and cut off about one fourth of the pasta dough from the round. Now start rolling until the dough is as thin as you can get it. 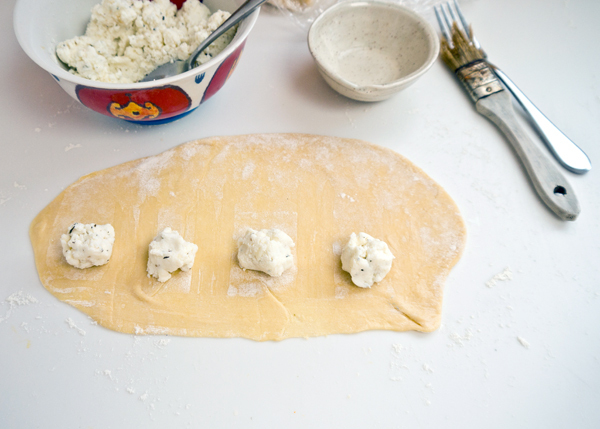 You want the section of dough to be long and wide to create the ravioli. Place a small scoop, about one half a teaspoon, of the cheese filling along one of the edges of the dough, leaving about an inch between scoops. 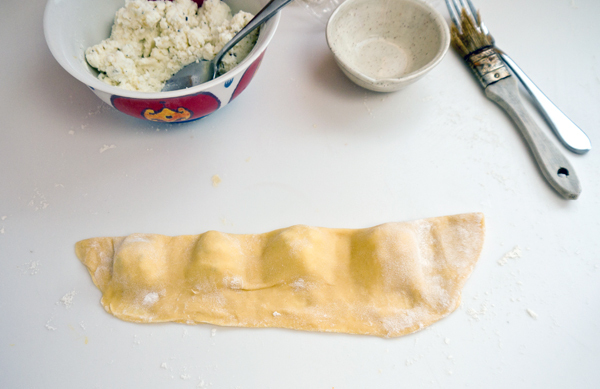 and then fold over the dough, pressing between each round to seal the pasta. 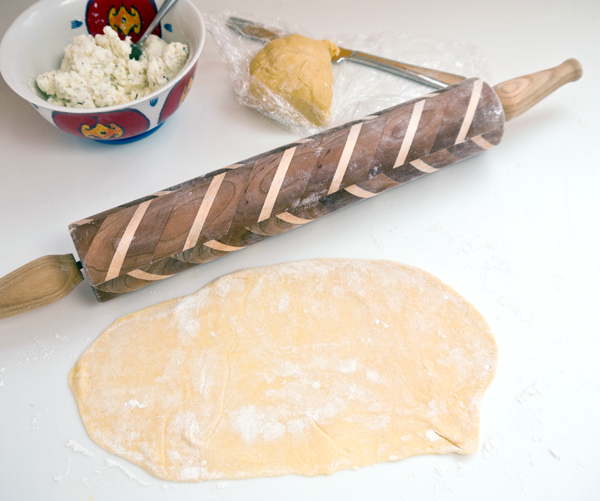 Use a pizza cuter to cut around out the ravioli, reserving the leftover bits of pasta dough. 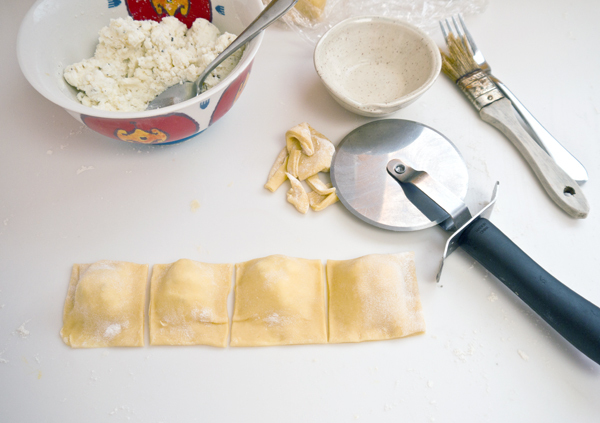 Use a fork to crimp the edges of the ravioli, helping to seal the pasta, keeping that delicious filling where it belongs. 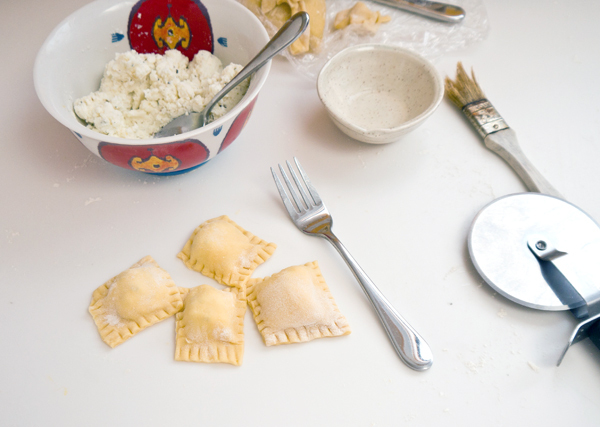 Place the finished ravioli on a flour-dusted plate while you continue rolling ravioli. When you’re ready, bring a stockpot of salted water to a boil. Pop a few in the water and let simmer for four to five minutes. Remove and serve with your favorite sauce. It’s that simple! 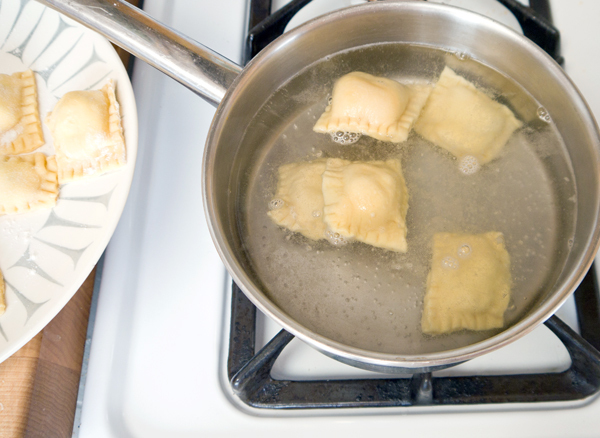 I’d love to tell you how many ravioli you get out of this recipe, but I lost count. 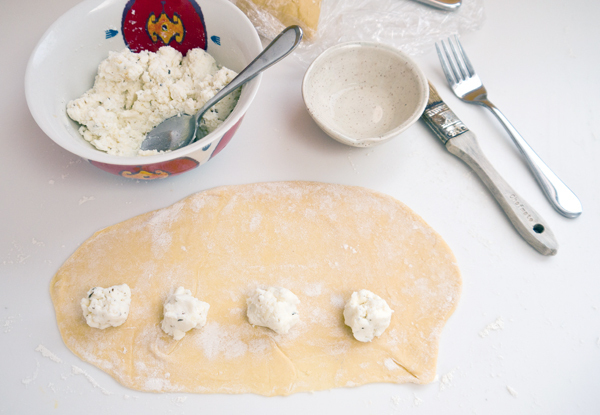 And if you get tired of rolling, simply wrap the pasta dough in plastic wrap and pop in the fridge for another day. These look sooooo good! I’ve been wanting to make a lasagna filling version. Like little bites of lasagna. Does that even make sense, lol? YES! In fact that sounds delish! Finally, a simple yet perfect recipe. Looking forward to trying it. Only problem is the flour. Is there something more healthy and gluten-free you could use? What about the sauce? please. Kate – for the sauce, I have a sneaky way of making jar sauce creamy good. Put a 20-ounce jar of your favorite marinara sauce (no meat!) in the blender with 1-cup whole milk and blend. The result is a really delicious topping for pasta. if you can add a Pinterest icon we can share it on Pinterest. Sounds yummy…I am interested in the response about the gluten-free.